In recent years much has been made of the ‘globalization of cycling’. In particular the UCI likes to trumpet its role in this movement with the 2010 World Championships, which will be held in Australia, being promoted as a major step in that direction. Truth is that cycling has been a global sport since the very beginning of organized cycling in the 19th Century. Australia for example, is host to the oldest track cycle race in the world. The Austral Wheel Race was first run as a 2 mile event in 1887 and was won by H. Lambton who took home a walnut cabinet containing 152 pieces of silver and cutlery as his first place prize. In 1901 the race was won by the American, “Plugger” Bill Martin. First prize was a Grand Piano which Martin probably sold to pay for his sea passage back home. The race has been run every year since 1887 except during the WWI period between 1914 to 1919. Research shows that in almost every corner of the world races and many national federations can trace their roots back to the 19th Century or very early 20th Century. In addition to Australia and the USA, the bicycle rapidly took root in Japan, China, South American countries, Russia and of course Europe. Historians typically note that during that period, cycle racing was the most popular sport in the USA. In particular track racing attracted huge crowds, bookmakers and media coverage. 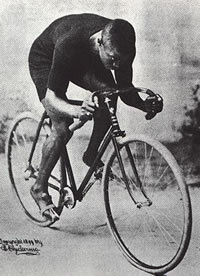 Marshall “Major” Taylor from that era is one of the most famous legends of all cycling history. At a time when racism was particularly vile, Taylor was a super-star both in the USA and Europe. He won the first world track championships in 1899. However as a black athlete his travels on both sides of the Atlantic are peppered with many ugly stories and often he was barred from racing against Caucasians. At a time when long distance travel was a huge undertaking, it is not surprising that cycling evolved along national and regional lines. Today racing cyclists travel from country to country and hemisphere to hemisphere with comparative ease. Until relatively recently many professional riders always considered the Tour of Lombardy as the last race of the season. Now many will jump on a plane after that race and head off to the Japan Cup. To maintain fitness and set the foundation for the next season during the cold Northern Hemisphere winter, increasing numbers of riders relocate to Australia or South Africa to train and race. During my formative years as a racing cyclist (in the 1960’s) our club runs frequently took us to the Kent coast in Southern England. Just 21 miles distant you could see the French coast. On mainland Europe cycling was then, and still is, a major sport with massive public and media appeal. Just twenty one miles distant in Britain the same sport was considerably less than a minor sport. In the same way that Greg LeMond and Lance Armstrong created extensive nation wide recognition of professional cycle racing in the USA, so did Tom Simpson in Britain during the 1960’s. Sadly with Tom gone cycling once more slipped into the shadows until the British road and track successes of the past decade or so. Throughout the 20th Century cycling in its many forms evolved and continued to hold worldwide appeal. There is no question that the epicenter for prestigious cycle races rapidly focused on mainland Europe. Today we know these races as the Grand Tours, the Five Monuments, the classics and many other highly coveted races. Racing cyclists from around the globe with ambitions to reach the pinnacle of the sport will invariably end up racing the roads of Europe. The new World RR Champion, Cadel Evans, is the latest in a long line of illustrious Australian names to successfully make that hard journey. One of my favorite non-European riders is the great Columbian mountain climber Luis Herrera. He raced as a pro from 1985 to 1992 to become the second rider after the legendary Federico Bahamontes (Spain) to claim the KOM jersey in all three Grand Tours. While cycling across the world has flourished throughout its history, it is the concentration of many countries on one compact land mass (Europe) that ultimately led to the formation of elite pro racing as we know it today. Prior to the Pro Tour years many races maintained a dominantly nationalistic flavor. The history of the Giro d’Italia and the Vuelta a Espana for example clearly illustrate that until a decade or so ago, it was very rare for a ‘foreigner’ to claim such races. In 1985 Scotland’s Robert Millar was on the verge of winning the Vuelta. With two days to go he was in the leader’s jersey with an apparently unassailable lead when he was attacked by eventual winner Pedro Delgado. Having escaped with another rider, Delgado destroyed Millars time advantage while behind him the Spanish riders ‘closed ranks’ and made it all but impossible for the Scots rider to rescue what should have been his Grand Tour victory. Likewise the Giro was also notorious for locking out non-Italians and ‘combines’ frequently formed to ensure a home victory. This, amongst many other considerations, is why Andy Hampsten’s 1988 Giro victory is still regarded with such high esteem. In fact Hampsten was not only the first American to claim the race but right up to the present time is still the only non-European winner of the race. While national pride has also been a strong feature in the Tour de France, Tour of Flanders and Paris-Roubaix, these great races along with many others have been somewhat less dominated by local interests. In particular the Tour de France has been a ‘global’ race since the very early days. The race founder, Henri Desgrange, although a huge patriot, was more interested in creating the ultimate athletic challenge. If the winner was French so much the better but he created race rules designed to offer a ‘level playing field’. Dirty tricks, nationalistic or otherwise were dealt with severely. It must be said that the UCI’s Pro Tour has done much to break down barriers and create an environment where a truly international peloton populates the great races of the world. From the Tour Down Under in Australia to the Tour of California in the USA and Britain’s Tour of Britain, elite multi-national fields are lining up all over the world. However it must also be said that the UCI is doing no more than responding to our high tech, interconnected world where the concept of the ‘global village’ is becoming a reality. A look at the list of current UCI registered Pro Tour teams reveals that the majority of major sponsors are corporations with world wide business interests. Last season the French (regional) Agritubel team disbanded to leave Euskaltel-Euskadi as the final ‘national/regional’ Pro Tour team. The combination of global corporate sponsors along with the UCI’s global vision is facilitating ‘globalization of cycling’ in ever increasing dimensions. Australia’s Tour Down Under and the USA’s Tour of California are two shining examples of success. And this environment is sure to nurture more new major races in other corners of the world. For some time both the Tour de France and the Giro d’Italia have been linked to efforts to hold stages in the USA. The logistics for such undertakings are enormous but if the will and financing is there, anything is possible in our ever shrinking world. And the reality of seeing these European gems on the roads of the New World may not be far off. If “Plugger” Bill Martin or Marshall ‘Major’ Taylor were with us today they would wonder why we are even talking about the globalization of our sport. In the 1890’s these pioneers of cycling were already globe trotting. And for anyone of our current generation who thinks that globalization is a cool new idea, then they have been wandering around with their “eyes wide shut”.